In most states, a pregnant woman who ingests chemicals or drugs that may harm her baby would be referred to a clinic or counseling center. In Alabama, they are subject to criminal prosecution, a reality that Catholic University law student Amy Kokot (Class of 2014) says amounts to a willful misapplication of the law. 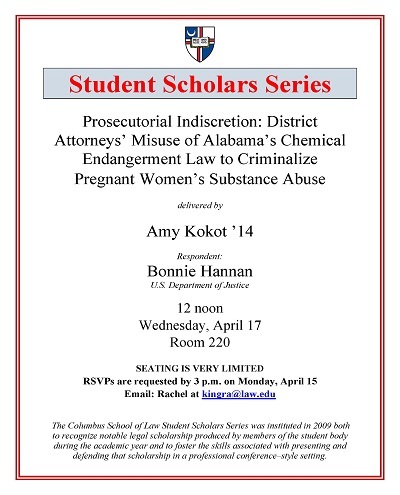 In the third and final installment of the 2012-2013 Student Scholar Series given on April 17, Kokot argued that prosecutors have misconstrued the intent of the state legislature when they prosecuted and jailed some mothers whose newborns tested positive for substances such as cocaine. Kokot, Amy, "Prosecutorial Indiscretion" (2013). Student Scholar Series. 24.